Hi guys! I know it's been a little quiet around here, but I'll have a few collections up very soon. The December Polish Pickup will be opening up this Friday at 11:00 AM EST, and unfortunately you may need to have some ninja fingers for this round. Since the makers will have a limited amount of time to ship items (due to the holiday season), every item will have a cap this month. Some will have a cap of hundreds, while some, like the one I'm showing tonight, will be very limited. 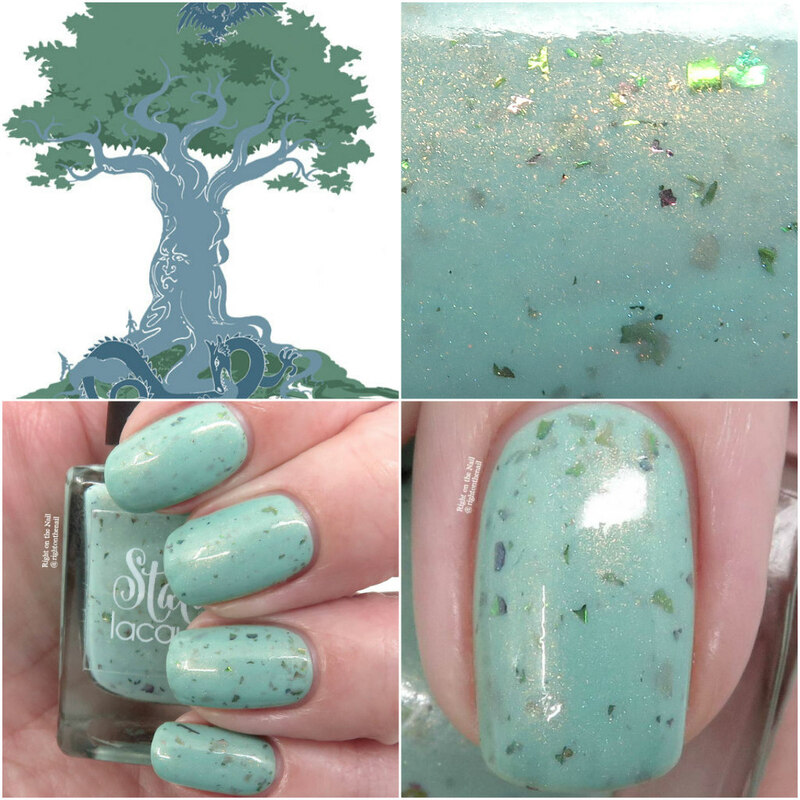 The December inspiration was Enchanted Forest, and Stacy from Static Lacquer was inspired by the immense mythical tree Yggdrasil which connected the nine worlds in Nordic mythology. How cool is that, right?! This one will be available this Friday-Monday with a cap of just 25 bottles for $12 each. Yggdrasil is a light minty green crelly base with pink to green UCC flakes and a strong copper shimmer finish. If you're not huge into flakies (but why aren't you?! ), you'll still like Yggdrasil because it's light on them. The copper shimmer really stands out and is more evident in person than in photos (it still stands out in the bottle though). The first coat was a bit sheer, but it built up well in 3 thin coats. It dried with no texture, and was easy to remove as well. Again, this has a cap of just 25 bottles, so if you plan on making multiple orders, make sure to get this one early so you don't miss out. To make things easier, make sure you have an account so you can start a wishlist on the website. I have an alarm already set for 10:58 AM EST (hey, a girl needs an extra couple minutes to prepare)! You can learn more about Static Lacquer on their website, Facebook, Group, and Instagram pages, while you can find more about PPU on their Facebook page and website.